The Outside of This Arts and Crafts Bungalow was Restored, and the Inside Is a Great Blend of Old and New! 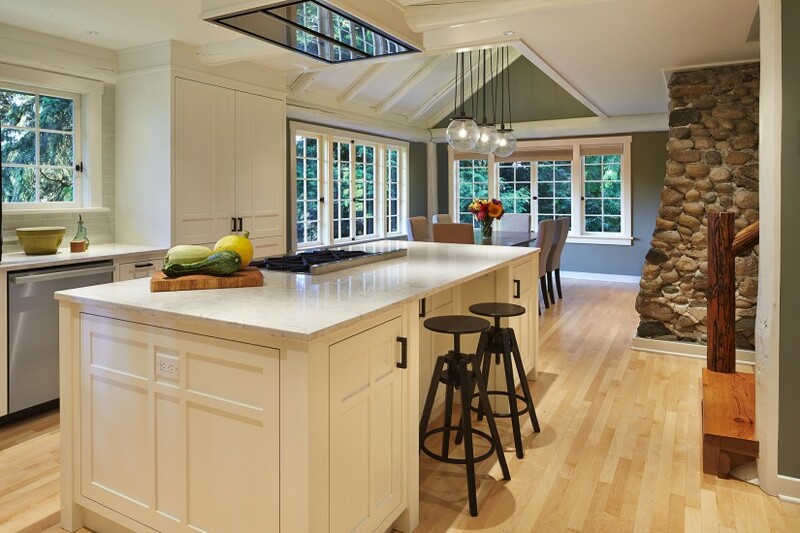 When the Arts and Crafts movement began in England in the mid 19th century, the founders couldn’t have guessed how much their ideas would influence home design in America a few decades later. Or just how much we love each Arts and Crafts Bungalow and Craftsman home the movement spawned. 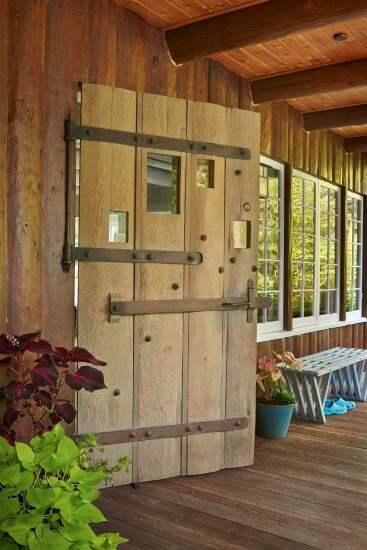 The owners of this Arts and Crafts Bungalow in Beaux Arts, a suburb of Bellevue, Washington, fell in love with it’s rustic character, but not the sub-par remodelings that had been done before they got their hands on it. Architect Amy Janof got her hands on it, and transformed it into a bright, open home that perfectly balances historic and modern. This home’s been featured in magazines and has won design awards for the even-handed transformation. 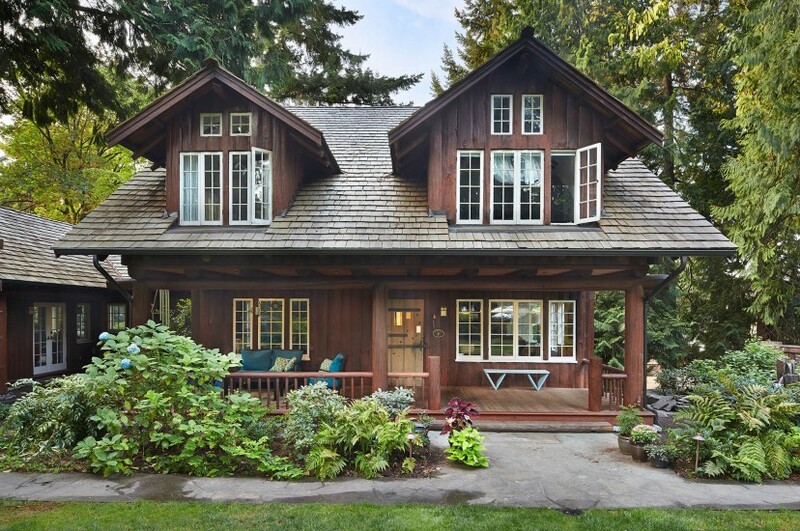 We think the Arts-and-Crafts “lodge” look of this home is pretty special, and we’re so glad the owners and Architect decided to keep as much of the original character as possible! But a historic home has to be livable, right? And this bright, open kitchen is exactly that. 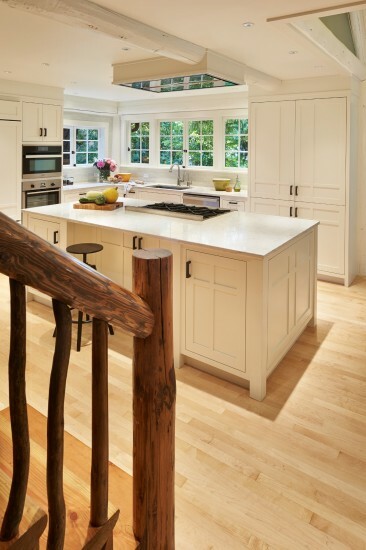 New wood floors, and white cabinets and countertops are an interesting contrast to the log-and-branch stair baluster. 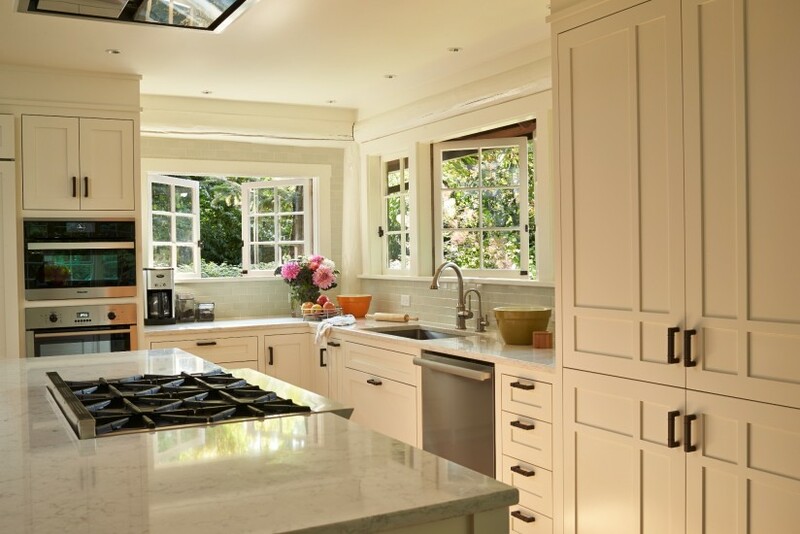 Wide casement windows at the corner of the kitchen bring in light. The all-white palette points your attention to the outside. 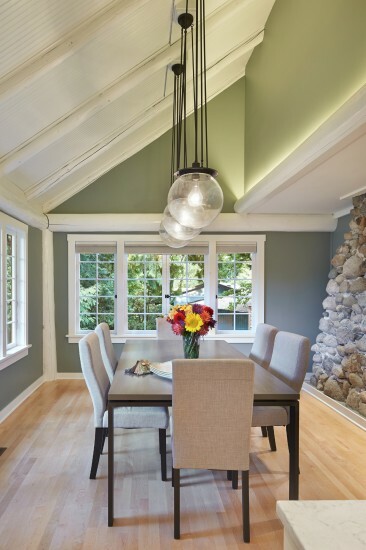 The kitchen opens to this casual dining area – they’ve kept the log framing at the walls and ceilings, but painted them white, helping brighten and update the house. 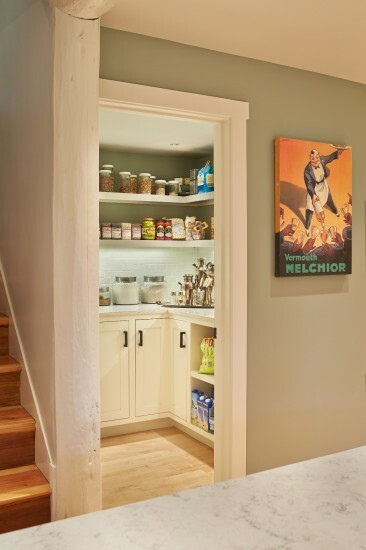 Here’s the new walk-in pantry – open shelves, countertops, and cabinets make this more than just a closet – it’s also a food prep area. It wouldn’t have been the same house without the original massive log front door and iron strap hinges! We’re curious about the four small openings in the door – what do you suppose they were for? 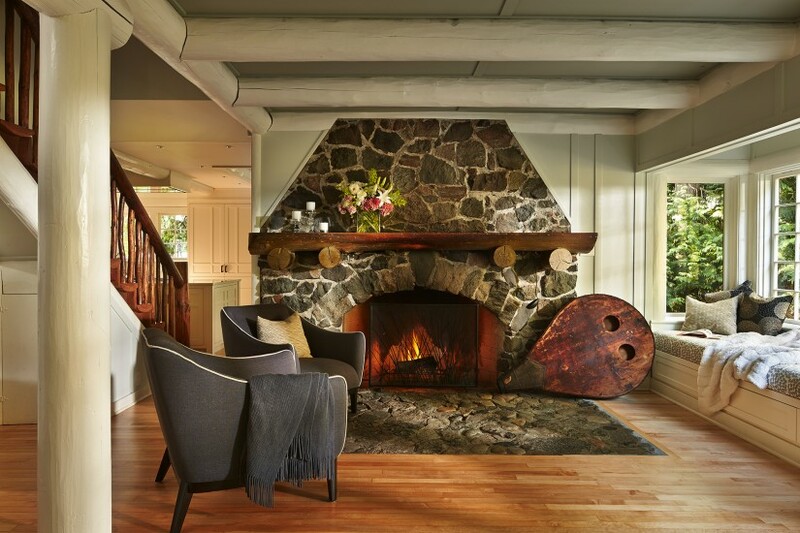 There’s so much going on in this wonderful hearth room – the giant flagged-stone fireplace with an enormous hearth; the log mantlepiece supported on log corbels; the big, comfy window seat; the custom fireplace screen… Painting the logs improves what was probably once a very dark room – we think it’s a room that really feels like “home”!